Starting today and lasting through Sunday, July 27, backers for crowdsource funded Shroud of the Avatar will be able to log into the game and experience Release 8, which brings PvP to the game. They initially were not expecting to have PvP in game this early. In addition to PvP, R8 has a ton of new added in features and adjustments. If you look at their release notes, you'll notice that changes to the game are noted by strikethrough and what's added in is noted by italics. Spoiler alert: that's a lot of italicized print. One thing I really like is that at the end of the post, there is a section where they want to manage expectations. I think that managing expectations in games is something that's often overlooked, but can be crucial to game enjoyment. I know this doesn't always work, especially whenever I talk to people who were extremely disappointed in STAR WARS: The Old Republic for it not being the next Galaxies, even though I'm not sure how anyone could follow SWTOR and have that expectation. For SotA, the team wants you to know that visual quality and performance are still being tweaked, and they know this needs to be addressed. Combat doesn't include combos or advancement yet. A few other systems are also in their beginning stages, which the team hopes to have advanced by beta. SotA is still in alpha and there is room for a lot of improvements and changes going forward. So, what is in Release 8, then? Well, a ton of stuff, and that's putting it lightly. Seven zones have been turned into designated open PvP areas. You should expect anything from brawls, to small skirmishes, to all out war in these areas. Do keep in mind that PvP is imbalanced and the team is keeping an eye on things and taking note on where to go, as far as balance is concerned. It's constantly being tuned, but first they want to get PvP functional before balance comes into play. Remember, this is alpha. 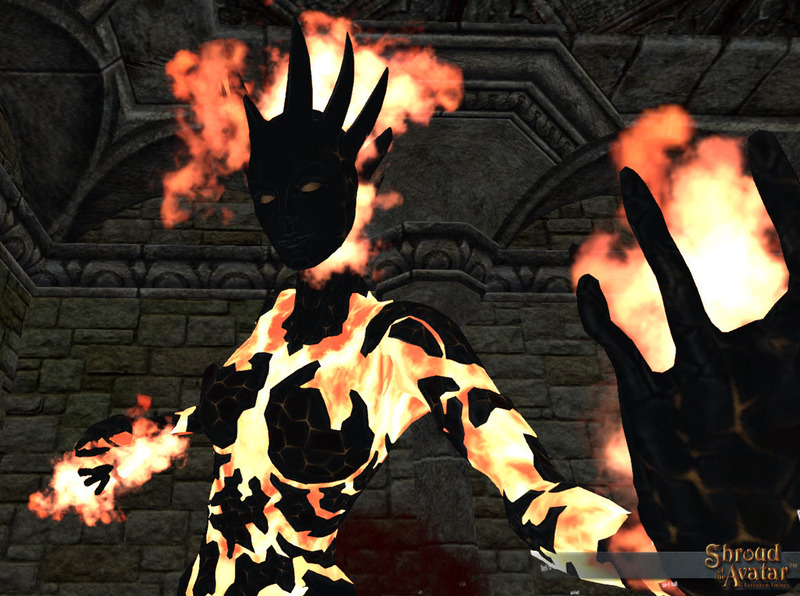 Release 8 will also see 23 new skills added into the game, one of which includes Summon Fire Elemental. This will be the first time that a pet is added into the game, so the devs will be watching this closely to see how it functions in players' hands, what needs to change, and how they can approach additional pets and what behaviors need AI adjustments, and so on. Our Lady of Fire is a first look at pets (they also mention taming in the notes, so there's that morsel to chew on) and it'll be interesting to see how they approach pets and where they go from here. Other additions include collision improvements, spell fizzles and fails, jumping mechanics, target highlights on interactive objects, better detailed item tooltips, a new focus system, glyph combat and deck building. What are these last two, exactly? Think of decks as specs (you can have multiple and swap them out of combat), and you'll get a good idea. These last two were originally slated for Release 9, but they managed to get a functional version of the two in the game for players to test out and give feedback on. Skills are based on what armor you're wearing, so wearing heavy armor will give you tank-like skills. As your character progresses, you earn more skills. You can then spend points in various trees. Some skills need a certain amount of points to go into them in order to unlock skills further down. There are quite a few trees to go through and put points into. After you've allotted your points, you can save everything you've done into a deck. The system is greatly complex, and if you're interested in learning more about it, I highly recommend watching the above video. Seeing the walkthrough will give you a far better idea on what to expect than me trying to explain something I don't have first-hand experience with. Seeing how this system changes over the course of development from how the dev team wants to move it forward, what player feedback gives the team, and how players use the system will be interesting to watch. While I won't be playing this alpha test, I have been pretty interested in Shroud of the Avatar for some time now. I'm really curious to see how it'll continue to improve and what the team does with it. I'll likely pre-order the game in the near future (I'm moving soon, so I can't go too crazy with spending on my gaming habit! ), and I do look forward to seeing what will be next. Release 8 has a good amount of features and systems that weren't going to be added until at least Release 9, so I wonder what we'll see next time. Are you interested in Shroud of the Avatar as well? How do you feel about games like this and Trials of Ascension, where a return to MMORPG roots are one of the big aspects of the game? If this isn't your style of MMO, what are you looking forward to? Vendolyn's been playing MMOs since 1999, although Vendolyn in-game often becomes a long-term shelved alt. When she's not gaming, she's likely marathoning some questionable TV show or babbling about music to no end. She really likes goats.